A survey conducted by ECETOC found that to date, omics data has never been used to support a submission under REACH, though there has been use in supporting pesticide submissions in the USA. A problem is the lack of agreed consistent methods that can be applied to the analysis of ‘omic data. The third one is described below but the three individual RfPs are intended to be all interconnected as being part of the whole Omics package under the ECETOC-LRI long-term Transformational Programmes. Therefore, it is expected that researchers engaged on these projects will participate with the steering team and collaborate, share and exchange information with other grant awardee teams to the support the development of complimentary work products. All RfPs will build on the output from the ECETOC Workshop. Using a read-across approach, industry scientists and regulatory bodies (e.g. ECHA, EPA and FDA) seek to determine the toxicity profile of a compound with no/limited toxicity information by comparing features and activities of this compound to structurally similar compounds. Typically, chemical/structural similarities are employed. However, similar biological activity among compounds in the read-across would provide additional useful information. Important questions are 1) how much data is necessary and sufficient for a robust read-across argument and 2) what types of biological data are most useful. Using existing data bases identify two or three test cases for read-across using chemical classes with different types of toxicity (i.e. don’t use chemical classes that all target the liver). Then, develop dossiers for all of these test cases using 1) chemical/structural data and 2) biological data (that must include omics data). Identify what kinds of data are necessary to make sound a read-across argument. Identify what types of bioinformatic algorithms are most useful for read-across. How many tissues or cell types are required? Is single time point information sufficient or are multiple time points needed? Must read-across be performed using data derived from target tissues/cells or can surrogate tissues/cells be used? How much biological activity coherence is necessary; is there a quantitative threshold required? Integrate biological and chemical structural data into the final dossiers. Determine the best-practice for this integration. Define the range of cases that need to be addressed (MoA yes/no, info-rich, info-poor, complications of metabolism). 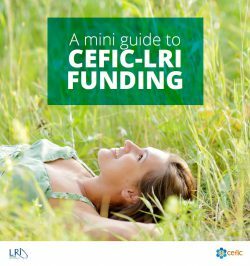 Download here the full version of the RfP LRI-C6.